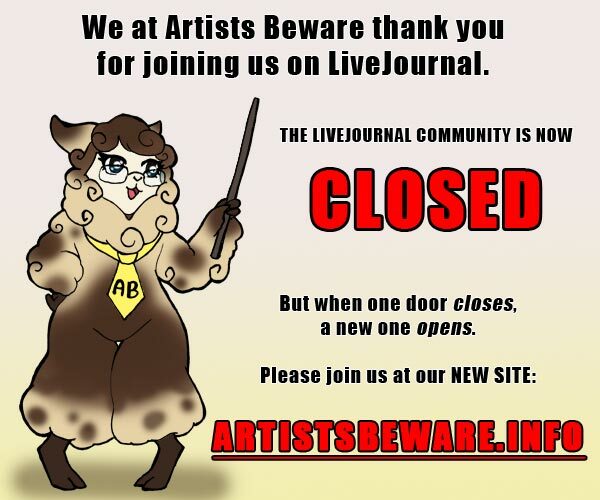 DAWN OF THE FINAL DAY - "Artists Beware"
The community is officially closed for business on LiveJournal. We are not going to answer any posts in the queue as of this posting. Membership is locked down; no one else can join/participate the community. We have elected to not turn off comments; if we did all the comments go away(yikes!). We realize comments in some of the older entries are valuable resources for some so those will remain. Members are still able to comment; but since the community is effectively shut down we ask that you do not and focus your activity to the new website. We are hand archiving the community; thanks but no thanks we do not need assistance this will only hinder the progress. Now what are you waiting for? GO JOIN THE SITE!